A real basic and simple curry, made everyday in my house back in Kerala. The taste varies dramatically with the kind of fish used. 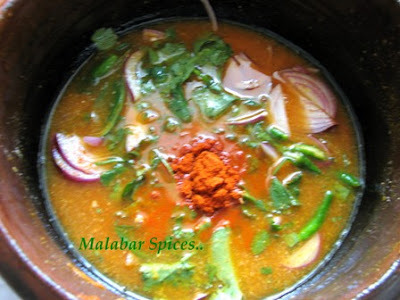 It is colloquially called Moliyaar, a corruption of "molagu chaar", meaning red chili sauce. Also called "puliyum Molagum" by others (tamarind and red chili curry). Hardly any oil, no coconut and no strong spices. 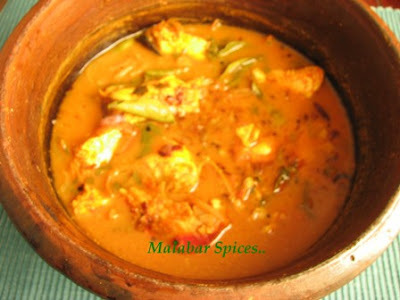 Just a watery sauce made with red chili powder and tamarind which flavors the delicate fish beautifully. It also suits the summer heat with minimal prep work. This is a curry I don't make often here as it doesn't taste good with fish frozen into a hundred years of sleep on huge slabs of ice. I generally fry the onions and spices to get rid of all excess water and to concentrate the curry. Ever tried following your mom and writing down a recipe while she zips around the kitchen adding hidden ingredients the moment your back is turned? The curry took 15 minutes from beginning to end and tasted good despite the simplicity and US fish. So here is the recipe but there is a disclaimer. I am not responsible for how this curry turns out in your house (unless you prepare it in front of me and show me the fish). The curry hinges on the freshness of the fish and will not taste good with frozen fish. So how do u know fresh fish? The experts start poking into the skin and eyes but queasy me does neither. If the fish looks firm and doesn't fall apart while washing or cutting, its fine. If you start preparing the curry and the house stinks, its not fresh and you better throw the curry out. A fresh fish curry should smell of the sea and not of the beach. 1.Rinse the fish and drain well. Soak the tamarind ball in 1 cup warm water and extract the pulp. 2. In a clay pot or any sauce pan, mix the onion sliced,green chilies sliced, ginger garlic paste, fenugreek seeds, chili powder, turmeric powder, chopped curry and cilantro leaves, salt and the tamarind water. 3. Cover the clay pot/pan and place on high heat. Let the water in it come to a boil. Simmer for a couple of minutes and then add the fish. Cover and cook on medium heat for about 5-7 minutes. Shake to combine the fish and gravy. Adjust the salt and remove from flame. 4. Heat the coconut oil in a pan and fry the shallots till they turn brown. Pour over the curry. Let the curry sit for at least 10-15 minutes before serving. This goes well with rice on the first day and with anything on the consecutive days. Frozen fish that sleep on ice for a hundred years? Well that is exactly how frozen fish feels no doubt. Red Curry looks delicious, mommy around enjoy yourself Shaheen. Hi shaheen, lucky lucky woman you -your mom's around! Didnt think it was hard to find reasonably fresh (as in not-frozen fish)in NJ. I just bought some matthi and a spanish version of aila yesterday out here in my part of the woods in LI. Still have to taste what it'll turn out like and I was planning on making 'khatta mirchi' too - 'puliyum molagum'??lol. So amma is here haaa ?? Enjoy girl.. Oh every time i got the ranch 99 I make sure the guy behind the counter is irritated with me. I peep into the eyes, lift the gills, poke the skin and still always unsure! The fish ofcourse !! This time hubby dear ordered a live fish from the fish tank...finally fish fresh !!! yeah, enjoying somebody else's cooking for a change. Anita, I bet we would be the same later. didn't know u ate fish. hi hi. Nitu, love the term khatta mirchi..laughed a lot for that.we hardly get fresh fish here inNJ. lucky u to get matti and aila. Sandeepa, i will surely try striped bass. thanks. Very very interesting Shaheen. Enjoy the way you write too :) Never heard of this preparation - should try it out soon. We call it "meen mulakarachathu"usually done with sardines(mathi)and the tamarind being kudampuli..in manchatti..
Making me really homesick..enough for now..:( not only the curry but me too turning red out of A-Asooya!!!;/.. Adipoli kozhikodan style meen curry .. Such a simple and yummy looking fish curry. Will try it soon.Thanks for the tips on buying fish :) Reading it made me feel queasy!!! Get pampered by ammma dear! Enjoy!! Your umma is with you, lucky girl! can imagine the taste of meen charu prepared by umma,me too going to be with her by next week..
mathy,nice to have a cousin who does all the dirty work. :) i get a manchatti each time i go home. maybe i should start selling them here. Manju, thanks for ur kind words. do try with kodam puli too, i am sure it will taste good. Asha, u must tried something similar somewhere. Let me know how u like it. Prajusha,this meen curry is only a fascimile of the kozhikodan curry. Jyothsana, i know, i am also the queasy kind... only learnt to deal with fish now. Seema and Sig, great that u have ur moms with u or are going to be with her soon. Enjoy! meen puliyum mulagum...mmmm my fav. the only difference in my mom's version is,shallots are added along with fish, and coconut oil n curry leaves added immediately after the fire is off. and my mom n dad around too..!!!! A very nice recipes by you. Thanks for all these tasty stuffs. By the way, there is a way to find out the fresh fish. Just open up the Gill cover and see the color of gill(chella). It will be blood red for a fresh fish and will turn darker and darker as the time passes, just like your blood color changes after it is taken out of your body. If the gill color is very dark, better dont buy it. Enthu cheyyana, kora mulakittathu kandu veruthe vellam irakkukka, naatile orma varunnu. Meen curryude manam mookilekkadikkunu. Good post , i am trying this @ home , i think it taste great, let me try..